To spread the word, Tim began touring Australia's East Coast with a projector in the back of his car. He would show his amazing footage from pro surfing events 'hot off the press' in the pubs and clubs. The Australian Surf Movie Festival concept was born. In just a few short years, Tim grew the festival from its humble beginnings to sell-out crowds at large venues and independent cinemas throughout Australia's East Coast, as well as internationally. Tim has travelled the world, capturing amazing surfing action, creating award-winning documentaries and making surfing DVDs that are among the all-time best-sellers in Australia. After having his camera, lenses and batteries stolen on a shoot in big wave destination Nazare Portugal, Tim decided to re-equip with a Red Scarlet Weapon. 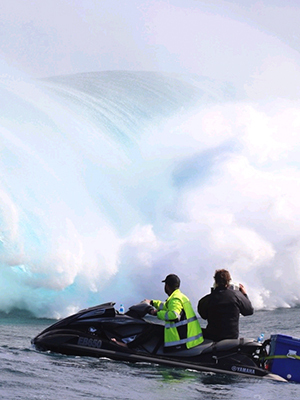 Getting close to the action when filming surfers means shooting from a jet ski, with the camera in a waterproof housing. When it came to battery power for the set-up, a unique set of challenges became apparent. Tim is often out on the ocean for 8 to 10 hours at a time, reluctant to come back to the shore to swap batteries or media in case he misses the big wave of the day. The camera housing has a limited amount of internal space for batteries, so Tim clearly needed the highest possible energy density to keep weight down and power the camera for as long as possible. The Red Brick has a capacity of 153Wh and Tim was told that it would power his set-up for 2 hours. Super high-capacity Li-Ion batteries of 200Wh or more are available from various manufacturers, but in every case Tim found these were too large and cumbersome for use inside the camera housing. Li-Ion batteries that have capacities greater than 160Wh are also forbidden from passenger aircraft by IATA regulations. This would prevent Tim from flying with his batteries to the various surfing destinations around the world, which is such an important part of his film making. That's when Tim discovered the PAGlink system, made by UK-based company PAG, one of the film and TV industry's longest established battery manufacturers. The PAGlink system allows batteries that have individual capacities of 96Wh to be linked in parallel, achieving a combined capacity of 192Wh, or, if you link 3 batteries, 288Wh. The system allows up to 8 batteries in any state of charge, to be linked for discharging as well as charging. 96Wh Li-Ion batteries are not restricted in quantity when you fly, and the PAGlink system was conceived with this in mind. In terms of size, Tim's camera housing accommodates two PAGlink batteries, easily. Two batteries are a total of 85mm wide, 130mm in height, and protrude no more than 100mm from the back of the camera. At only 740g each, they are lighter than other manufacturer's batteries of an equivalent capacity. However, for Tim, a combined capacity of 192Wh falls short of 'all day power'. Tim contacted Frank Nicolaci at Adimex, PAG's Australian distributor, and discovered that a new battery was just about to be introduced that would enable him to stay out on the ocean longer. PAG was about to launch the PL150 - a 150Wh linking battery - incorporating the latest high-capacity (10Ah) Li-Ion cells in the same case as the PL96. The new battery offers a 50% increase in capacity with no increase in size, and only minimal increase in weight (30g per battery). Two PL150 batteries in the camera housing provide 300Wh, greatly extending the run-time of the camera. Tim told us, "When I heard about the 150s, it was like... there is no choice! PAG is the only way to go. The size and convenience make it a no brainer. They work so well for me. I now have two PL150s and four PL96 PAGs. Two 150Wh batteries is the maximum I can fly with, but I can take as many 96Wh batteries as I like. On the jet ski I have a waterproof Peli case to keep the spare batteries dry. With two 150s in the housing I'm getting fantastic run-time. When I need to swap the batteries over I can do it without having to return to the shore. When you are out in monstrous seas shooting crazy surfing, you need the best batteries money can buy. I couldn't rely on a full day of shooting without PAG batteries".